As I sat alongside a Steele County road just south of Owatonna Sunday afternoon while we dealt with a crabby toddler, I glanced across U.S. Highway 218 and noticed another vehicle parked near the railroad tracks. 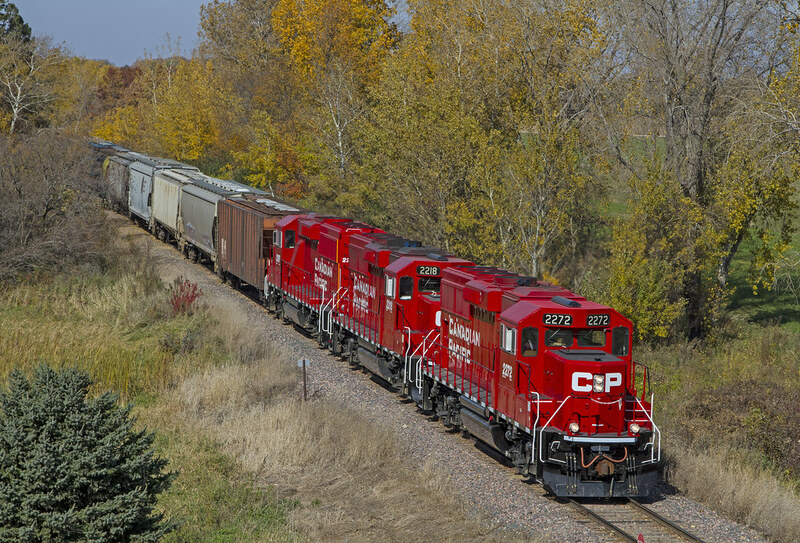 Soon enough he stepped out of his car with camera in hand and focused on the Canadian Pacific train, pulling a mix of grain cars and boxcars, chugging down the tracks headed south towards Austin and points beyond. This was the very train, shown above, I saw being photographed and I like to think that as I sat in my red SUV that this photographer in the blue VW noticed me too. Throw in the fact that I found this photo today and that is what us in the business call fate.